Most of the food waste and manure produced in developed countries is currently disposed of by use of either aerobic or anaerobic microbial decomposition. The former occurs with composting, while the latter takes place in lagoons and landfills. Microbial decomposition or organic matter emits substantial amounts of greenhouse gases each year, primarily in the form of carbon dioxide (CO2) and methane (CH4). The Food and Agriculture Organization of the United Nations estimates that these emissions totalled 3.5 Gt CO2 equivalent in 2011. One potential advantage of using Black Soldier Fly larvae (BSFL) is the animal’s ability to recycle large amounts of carbon into edible insect proteins and oils rather than simply breaking it down into carbon dioxide and methane. We sought to experimentally quantify the potential impact on greenhouse gas emissions that might be produced by utilizing BSFL as an economically and environmentally useful reservoir for carbon that would otherwise be emitted into the atmosphere by microbial decomposition. Identical quantities of moist feed material were allowed to be completely consumed by BSFL or microbes. BSFL completely consumed the feed material in 7 days; microbial decomposition required 45 days before the material appeared to be completely consumed. Based on carbon mass balance, when BSFL were present, 28.54% of the carbon initially present within the system was lost to the atmosphere in the form of CO2 along with a negligible amount of methane. When BSFL were not present, 48.62% of the original carbon present was lost to the atmosphere. The difference between the two systems with respect to carbon lost to the atmosphere was statistically significant (p<0.05). Insect larvae converted an average of 41% of the feed carbon present into body mass in the forms of protein, edible oil, and chitin. Massive amounts of organic waste are generated globally each year. Recently, the unique properties of the larva of the Black Soldier Fly (Hermetia illucens) have stimulated considerable interest in using this insect as an alternative means of disposing of organic waste materials [1-3]. The United States alone generates roughly 66.5 million tons of food waste and over 1 billion tons of animal manure annually [4,5]. The production worldwide is far higher; it has been estimated that 1.3 billion metric tons, or nearly one-third of all food produced each year, is lost to waste and spoilage . The vast majority of this material is placed into composting operations, landfills, and lagoons, or spread onto fields where it is decomposed by micro-organisms into carbon dioxide (CO2), methane (CH4), and inorganic compounds. The volume of greenhouse gases (GHGs) created in the process is considerable. Worldwide, manure alone generates over 18 million metric tons of CH4 emissions annually through anaerobic decomposition . Because CH4 is a more potent greenhouse gas than CO2, this is the atmospheric-warming equivalent of more than 500 million tonnes of CO2 . Far higher volumes of CO2 are returned to the atmosphere each year by the aerobic decomposition of food waste and manure. Because the greenhouse gases produced by the decomposition of organic waste are significant on global scales (e.g., ~10% of the global CH4 budget) it would be useful to develop methods of recycling that would help mitigate its adverse environmental impact. The Black Soldier Fly (Hermetia illucens) is a non-pest insect that is known to be a useful means of converting food waste, animal manure, and other organic substrates into protein, edible oils, and chitin. Black Soldier Fly larvae (BSFL) are voracious eaters, and can consume more than twice their own body weight of hog or poultry manure each day under favorable conditions . BSFL not only digest feed material quickly, they convert it into relatively high-value products such as protein and edible oils. Dried black soldier fly prepupae contain 42 percent protein and 35 percent fat, and have been shown to be an excellent feed source for swine, poultry, and fish [10-12]. Black soldier fly-mediated recycling has other benefits as well, including reducing the odor of decaying organic material, reducing populations of house and stable flies, and reducing the mass of organic waste. BSFL fed on manure have been shown to reduce counts of E. coli and Salmonella species in the residual material by up to 107 [13,14]. While disposing of organic waste by feeding it to black soldier fly larvae is quite promising, we are unaware of any studies quantifying its potential impact on the production of GHGs as compared to other “green” technologies such as aerobic composting. There are several ways in which BSFL could have a favorable impact on the environment in general and carbon emissions in particular. First, BSFL that are harvested and preserved can provide a short-term means of sequestering carbon that would otherwise be released into the atmosphere by the process of microbial decomposition. Second, food is environmentally expensive to produce; agricultural production provides the lion’s share of greenhouse-gas emissions from the food system, releasing up to 12,000 million tonnes CO2 equivalent a year . By directly converting food waste back into edible proteins and oils that can be utilized by animals or people, BSFL can potentially reduce the primary agricultural production of greenhouse gases. Third, large quantities of food are still obtained by harvesting forage fish in the wild and processing them for use in fishmeal. Worldwide catches of forage fish and fishmeal production have declined significantly since 1994 . To the extent that BSFL could replace fishmeal as a valuable source of animal and aquaculture feed its use could reduce both fuel consumption by fishing fleets and the pressure on vulnerable stocks of wild fish. As a first step toward gauging the potential environmental impact of large-scale BSFL production we performed an experiment to measure the quantities of carbon-based gases released by BSFL and aerobic microbial digestion as determined by measured carbon mass balance, and to compare their relative production of carbon dioxide and methane. Six 950 mL ball mason jars were used as containers for the feed material to be used in the study. Two types of screwon metal lids were created for each jar. The first type of lid was perforated along one-half of its width with seventy 1.5 mm holes that would allow air into and out of the jar. The second type of lid was kept airtight and fitted with a Swagelok septum bulkhead fitting that could be used for drawing samples of air with a 50 mL Luer lock hypodermic needle and syringe. The feed material itself consisted of Payback® Egg Layer Ration Pellets that was 60% saturated with tap water on a weight/weight basis. Fresh wild rabbit manure was dried and used as a source of microorganisms for inoculating the composted material. Seven to ten-day old Black soldier fly larvae obtained from Symton Black Soldier Fly Solutions (http:// www.symtonbsf.com) were used in the BSFL arm of the study. Two infrared heat elements connected to a thermostat were used to keep the experimental systems at a constant temperature of 25°C. A conventional electric food dehydrator (Nesco Harvest 400) and tray covers was used to dry both larvae and residual digested material at 105°C for 24 hours. A preliminary trial was run to determine optimal feeding rates for the actual experiment and estimate the digestion time needed for both the control and BSFL containers and to test the lids, seal, and sampling process on the system. To conduct the experiment itself, the six mason jars were weighed and labeled 1-6. Jars 1-3 were assigned to the BSFL arm of the trial, while jars 3-6 acted as aerobic decomposition/composting controls. Batches of feed material consisting of 63 g chicken feed, 83 mL of water, and 0.2 g dried rabbit manure were thoroughly mixed, allowed to sit for 15 minutes, and then added to each jar. Six batches of randomly sampled debris-free Black Soldier Fly larvae in their 2nd-3rd instar were counted out by hand with 714 larvae in each batch. Each batch was weighed, and one batch was placed into each of jars 1-3. A perforated lid was then screwed tightly onto each of the six jars. The jars placed on their sides with the perforated side of the lid uppermost, and gently rocked each day to mix the contents. The remaining three initial batches of BSFL were frozen to kill the larvae and then dried, weighed, and saved for later chemical analysis. The average of the weights was used as the reference value for the dry weight of larvae added to each jar. Each day for the first 7 days, a sequence of air samples was taken from each chamber at roughly the same time each day (10 AM) using a standard procedure. The perforated lid was removed from the jar and a lid with a Swagelok septum bulkhead fitting attached. The needle of syringe was immediately inserted through the septum and 90 mL of ambient room air was injected. Three 30 mL samples of chamber air were then taken in syringes fitted with Luer-locks: one immediately (t=0), at 3 minutes (t=3), and at six minutes (t=6) after sealing the jar. Each air sample was labeled and sent for gas chromatograph analysis to measure the concentration of methane and carbon dioxide. After 7 days of incubation the larvae appeared to have eaten all of the available feed material. Jars 1-3 were emptied of their contents and the larvae were separated from the residual material. Each batch of larvae was killed by freezing, dehydrated, weighed and packaged for later chemical analysis. The residual material was also dried, weighed, and packaged for chemical analysis. After 45 days of incubation jars 3-6 were judged to have consumed all of the available feed material. The contents of each jar were then dried, weighed, and packaged as described previously. A sample of the original dry chicken feed material was also packaged (Figure 1). Air samples taken from the jars were immediately taken to the gas chromatography lab at Portland State University, where they were quantitatively analyzed for levels of carbon dioxide and methane. Methane concentrations were measured by gas chromatography flame ionization detection on a HP 5890 GC-FID. Calibration is based on NIST SRM 1659a . Carbon dioxide concentrations were measured by non-dispersive infrared spectroscopy on a LICOR model 840 NDIR instrument. Calibration is based on NIST SRM 1672a . Precision of measurement of CH4 and CO2 is better than 1%. Net emission of CH4 and CO2 was determined by linear regression of the change in concentration with time and expressed as micrograms per minute, with standard errors reported from the regression . Samples of chicken feed, dried larvae, and residual digested materials were sent to the Mississippi State Chemical Laboratory at Mississippi State University and analyzed for their percentage of total carbon by elemental analysis. Statistical analyses were done to compare the BSFL with the control arms of the experiment using pooled, two-sided, Student’s t-tests. Gas chromatography analysis showed that the profile of carbon dioxide production by BSFL and microbial decomposition/control jars was significantly different over the first seven days of the experiment. Average measured CO2 emission rates in BSFL experiments was determined to be 5000 ± 3200 ug CO2/min (Figure 2). BSFL CO2 production rose rapidly from 1550 ± 200 ug CO2/min on day 1 to 4900 ± 1000 ug CO2/min on day 5 and then fell almost as quickly as their food source was exhausted. Average measured CO2 emission rates in microbial control experiments was 1700 ± 950 ug CO2/min, significantly lower than BSFL experiments. Also in contrast to BSFL experiments, microbial control CO2 production started near zero (12 ± 12 ug CO2/min) and gradually increased to 1820 ± 560 ug CO2/min on day 7 as the gas sampling period was concluded. The pooled differences in CO2 production between the BSFL and control jars were highly significant (p<0.01) for days 1 through 7 of the experiment (Table 1). 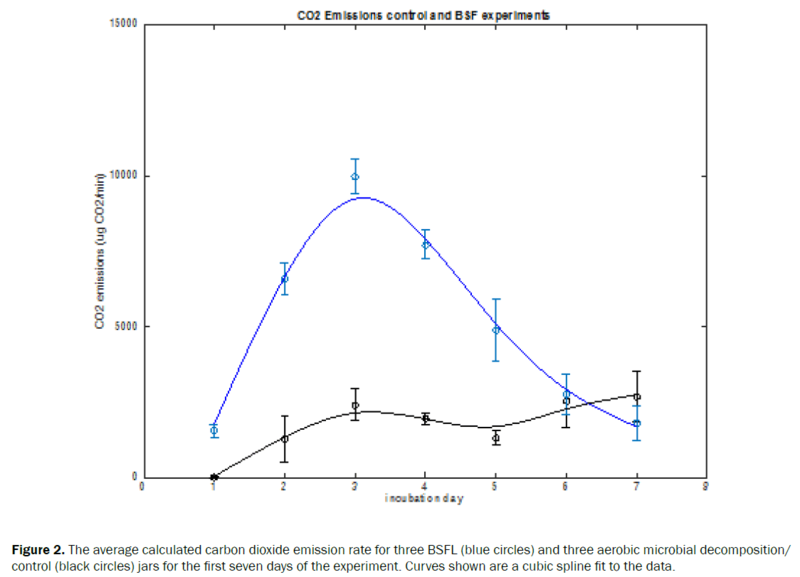 Figure 2: The average calculated carbon dioxide emission rate for three BSFL (blue circles) and three aerobic microbial decomposition/ control (black circles) jars for the first seven days of the experiment. Curves shown are a cubic spline fit to the data. Table 1. The average carbon dioxide emission rate values and standard deviations for the three aerobic microbial decomposition/control jars and three BSFL for the first seven days of the experiment. Emission rates of CH4 in both BSFL and microbial controls were low and highly variable (Figure 3). Emission rates from BSFL ranged from –0.05 ± 0.09 ug CH4/min to 0.03 ± 0.03 ug CH4/min (average –0.01 ± 0.02 ug CH4/min). Control experiments ranged from –0.02 ± 0.1 ug CH4/min to 0.42 ± 0.66 ug CH4/min (average 0.11 ± 0.16 ug CH4/ min). Neither CH4 emission rates from BSFL nor microbial controls were found to be significantly different from zero at high levels of confidence (p>0.20). The pooled differences between the two modalities also did not reach high levels of statistical significance (p=0.20). These results support the dominance of aerobic decomposition processes in both BSFL and microbial controls. 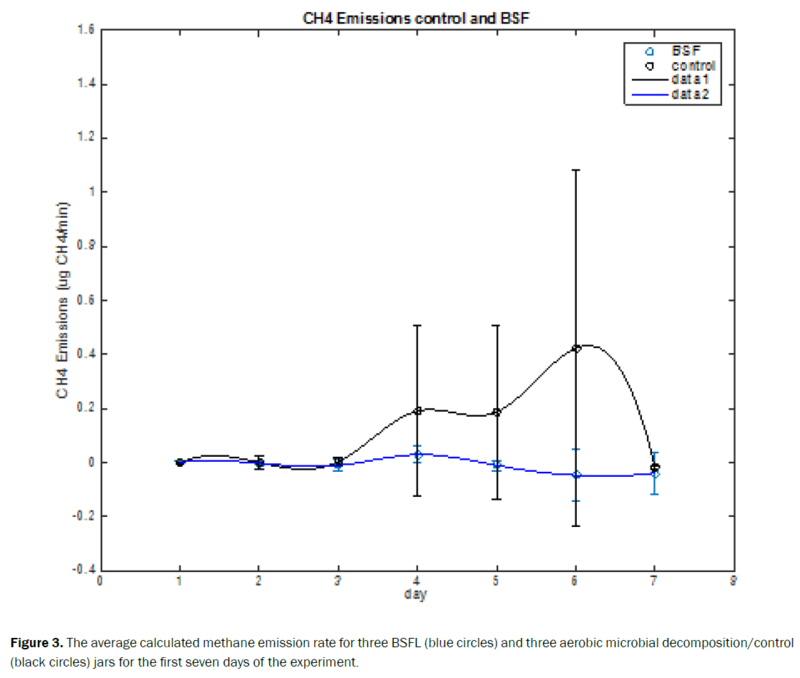 Figure 3: The average calculated methane emission rate for three BSFL (blue circles) and three aerobic microbial decomposition/control (black circles) jars for the first seven days of the experiment. A carbon mass balance was calculated both at the beginning and at the end of a 45 day period for both the BSFL and microbial decomposition/control jars. Initial mass of feed in each experiment was 63.0 g. The carbon content of feed was determined to be 28.34% by elemental analysis. At the conclusion of the experiment remaining feed and residue mass (together) was determined to range from 16.0-16.50 g for BSFL and 23.40-29.30 g for control experiments. Carbon content of remaining feed and residue (combined) at the end of the experiment was also measured and averaged 34.44%. Feed mass loss in BSFL jars (feed mass minus residue mass) averaged 46.7 ± 0.3 g (74%) compared with 37.3 ± 3.2 g (59%) in control experiments. Carbon loss (feed carbon minus residue carbon) was found to be 12.4 ± 0.2 g (70%) for BSFL experiments and 8.7 ± 1.5 g (49%) for controls. Differences in mass loss and carbon loss between BSFL and control experiments are significant at high levels of confidence (p value ≤ 0.05, two-sided pooled t-test), suggesting that BSFL significantly enhance the degradation of biomass in these experiments. Initial larvae mass in each BSFL jar was 8.10 g and carbon content was determined to be 52.26%. At the termination of the experiment larvae mass in BSFL containers averaged 23.0 ± 0.7 g (a 190% increase) and carbon content averaged 50.3 ± 0.5%. In containers that were used to grow BSF larvae, an average of 41% of the feed carbon present was converted to protein, edible oil, and chitin. Based on carbon mass balance of feed, residue and BSFL before and at the end of the experiment, carbon lost to the atmosphere was calculated to be 5.1 ± 0.2 g for BSFL experiments and 8.7 ± 2 g for control experiments. This difference was determined to be significant at a high level of confidence (p value=0.05, two-sided pooled t-test). Thus, based on mass balance, despite enhanced rates of organic degradation in neonate experiments (over the controls) net loss of carbon to the atmosphere was smaller due to carbon storage within the BSFL themselves (average 7.4 g) (Figure 4). Figure 4: Disposition of total feed carbon for each jar at the end of the experiment. 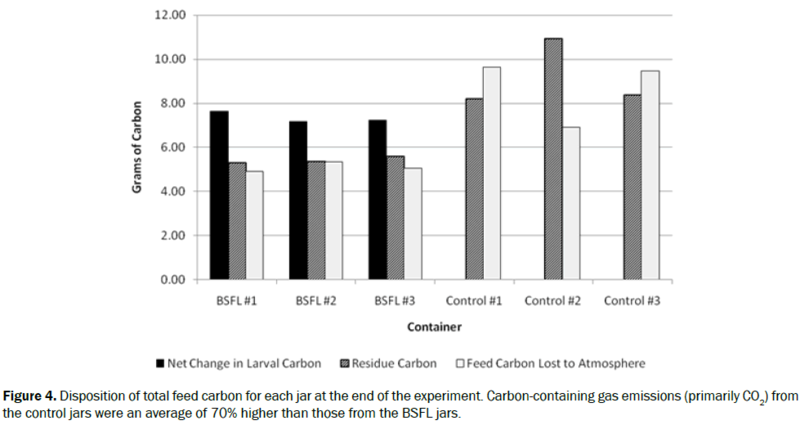 Carbon-containing gas emissions (primarily CO2) from the control jars were an average of 70% higher than those from the BSFL jars. Black soldier fly larvae are remarkable recyclers. They are capable of rapidly transforming just about any type of food or organic waste material into edible proteins, oils, and a chitinous exoskeleton that can be processed into a variety of useful products . A recent quantitative study by Lalander, et al. followed material flow through a continuous BSFL reactor for a period of 9 weeks, using a combination of hog manure, dog food, and human feces as the feed source. Their results showed a 55.1% reduction in total solids and an 11.8% rate of conversion into insect biomass. Nitrogen levels in the solid material were reduced by 56.8% and phosphorous by 35.3%, with a portion of this material being incorporated into the BSFL and the remainder released in the form of ammonia gas or lost due to experimental and/or analytical factors. The goal of this experiment was to specifically follow the flow of carbon through two systems: one based on feeding chickenfeed material to BSFL, and the other using microbial decomposition to simulate the process of aerobic composting. The primary purpose was to determine the relative production rates of carbon-based greenhouse gases emitted during these two organic waste disposal modalities. The results clearly support the idea that BSFL can be an economically and environmentally useful way to temporarily sequester the carbon present in organic waste materials rather than allowing conventional aerobic composting to directly convert it to carbon-based greenhouse gases. Compared to BSFL-mediated recycling, composting immediately releases 70% more carbon into the atmosphere and does nothing to offset the world’s rising demand for edible proteins and oils. This is not necessarily an obvious conclusion. Like BSFL, bacteria and fungi proliferating in organic feed material transform carbon-containing compounds into cellular material. Unlike BSFL however, microbes are unable to store this material into a stable and readily harvestable form such as animal fat. The result is a far greater loss of carbon into the atmosphere in the short-term, and an increased demand for farmland and wild fish over the long-term. Our experiments also verify that BSFL grown under these aerobic conditions do not generate significant quantities of CH4, commonly emitted during anaerobic decomposition of organic matter in landfills. These results have important implications for the methods chosen to dispose of food waste and manure. Composting is often considered to be a particularly “green” and environmentally friendly method for disposing of organic waste material in that it provides a rapid return of organic carbon to the atmosphere and is low in other GHG emissions (e.g., CH4). However, alternatives to composting (such as using organic waste as a substrate for the production of BSFL), may have additional environmental and economic benefits. If we assume that chicken feed has the same carbon profile as typical food waste, we can estimate the differential effect on GHG production that would occur if food waste were consumed by BSF rather than being composted. According to our calculations, every 1,000 metric tons (tonnes) of food waste consumed by BSFL would usefully sequester carbon that, if aerobically composted, would immediately produce 62.6 tonnes of carbon dioxide. If one were to take the 31.7 million tonnes of un-recycled food waste produced annually in the U.S. and use BSFL to recycle it, the insects would sequester 1.98 million tonnes of CO2 that would otherwise be released into the atmosphere, while producing about 2.28 million tonnes of valuable BSFL dry matter . This dry matter could be used to replace about half of the world’s declining annual production of fishmeal, most of which is used in aquaculture feed. Worldwide, the potential impact of substituting insect recycling for composting, landfill, and lagoon disposal is far larger. Estimates of the food waste generated worldwide are as high as 1.3 billion tonnes. Using this material to grow BSFL could potentially sequester over 81 million tonnes of carbon-based GHG’s, while producing roughly 93.6 million tonnes of usable dry BSFL biomass.6 The greatly reduced volume of residue produced in the process would be higher in nitrogen and phosphorus than the original material, and could be used as an organic fertilizer. Additional experiments using food waste and animal manure to determine whether the differential impact on greenhouse gas production is the same as in food-grade material would be particularly useful. Compared with sequestering carbon by use of insect-mediated food waste recycling, microbial decomposition processes such as composting release 70% higher levels of carbon-based greenhouse gases into the atmosphere in the near-term. Insects such as the larvae of the Black Soldier Fly capture the excess carbon and store it in the form of proteins, edible oils, and chitin, all of which have potential economic values that are higher than that of ordinary compost. The magnitude of the difference in CO2 production and the value of the resulting products suggest that insect-mediated recycling should be the method of choice for responsibly recycling food waste and other suitable organic materials. Harvey B. Black soldier flies as recyclers of waste and possible livestock feed. Entomology Today. 2015. Nguyen TT, et al. Ability of black soldier fly (Diptera: Stratiomyidae) larvae to recycle food waste. Environ Entomol. 2015;44:406-10. Jeanine B, et al. Loss adjusted food availability documentation. United States Department of Agriculture Economic Research Service. 2017. Jenny Gustavsson, et al. Global food losses and food waste – Extent, causes and prevention. Food and Agriculture Organization Of the United Nations Rome. 2011. Henning Steinfeld, et al. Environmental impacts of a changing livestock production: overview and discussion for a comparative assessment with other food production sectors. Animal Production and Health Division, Livestock, Environment and Development Initiative (LEAD), Rome, Italy. 2006:37-54. Diener S, et al. 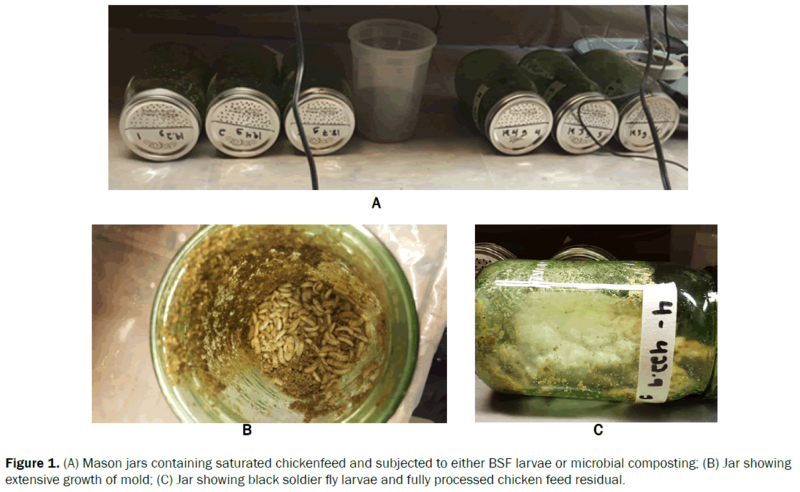 Conversion of organic material by black soldier fly larvae: Establishing optimal feeding rates. Waste Management & Research. 2009;27:603-610. Newton GL, et al. Dried Hermetia illucens larvae meal as supplement for swine. J Anim Sci. 1977;44:395–400. Hale OM, et al. Dried Hermetia illucens larvae (Stratiomyidae) as a feed additive for poultry. J Ga Entomol Soc. 1973;8:16–20. St-Hilaire S, et al. Fly prepupae as a feedstuff for rainbow trout, Oncorhynchus mykiss. J World Aquaculture Soc. 2007;38:59-67. Liu Q, et al. Larvae reduce Escherichia coli in dairy manure. Environ Entomol. 2008;37:1525-1530. Lalander CH, et al. High waste-to-biomass conversion and efficient Salmonella spp. reduction using black soldier fly for waste recycling. Agronomy for Sustainable Development. 2015;35:261-271. Natasha G. One-third of our greenhouse gas emissions come from agriculture. Nature. 2012. Christine M.Moffitt, et al. Blue growth: The state of world fisheries and aquaculture. Food and Agriculture Organization of the United Nations. 2014;39:552-553. Andrew LR, et al. Emissions of anaerobically produced methane by trees. Atmospheric science. 2010;37:1-5. Rice AL, et al. Measurements of carbon dioxide in an Oregon metropolitan region. Atmospheric Environment. 2011;45:1138-1144. Makkar HPS, et al. State-of-the-art on use of insects as animal feed. Anim Feed Science and Technol. 2014;197:1-33. United States Environmental Protection Agency. Advancing Sustainable Materials Management: 2013 Fact Sheet. Assessing Trends in Material Generation, Recycling and Disposal in the United States. 2015.